There are two types of almond, sweet and bitter. We use sweet almonds (Prunus dulcis) to make almond oil, but we use bitter almonds to make almond essential oil. The almond is part of the plum family. Botanically, they are a drupe and an ancient ancestor of large-stoned fruits, such as apricots, peaches and plums. The beautiful almond tree is a medium-sized tree with pinkish-white blossoms. It is native to the Middle East and North Africa, but now grown in the Mediterranean and California. 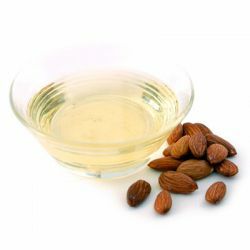 Almond essential oil is also known as natural benzaldehyde because the finished perfume material is made up of around 99% of it; bitter almond oil is distilled from the kernels of apricots and bitter almonds. Sweet almonds and bitter almonds are related, but the key difference between the two is the absence of amygdalin from the former. Amygdalin is used to make cyanide. The final essential oil is not dangerous, but the distillation of it is very involved, as cyanide gas is released during the process. This is neutralised during the process and no trace of it is left in the oil. Bitter almond oil smells nutty, characteristic of almonds and can be used to create almond, fruity and cherry notes in a perfume. We use the almond essential oil to add fruity notes to the Summer Pudding soap. This oil adds to the sweet strawberry scent of our new Mrs Whippy Bath Ballistic.